In the part of HYBRID MATTERs called invitations Lindström and Ståhl have during 2015 and 2016 invited participants to explore hybrid matters. 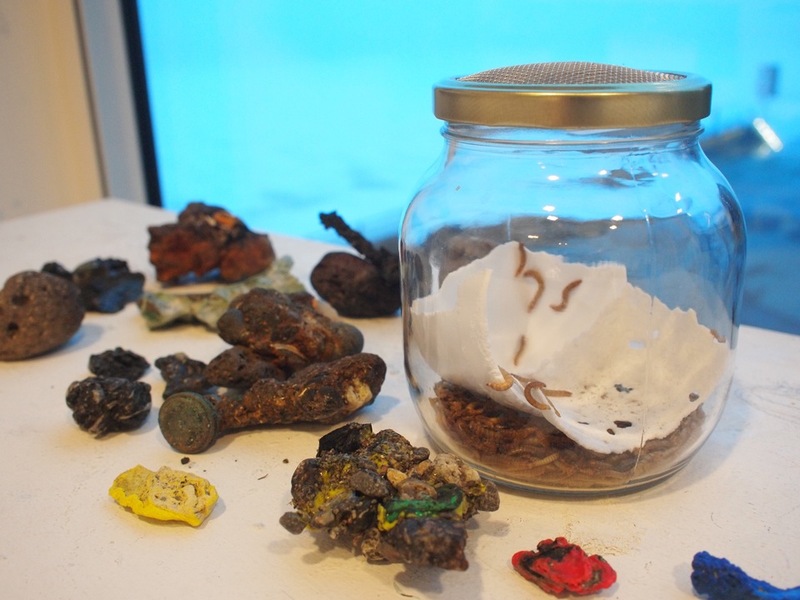 The invitations to public engagement events across the Nordic countries have started off with a couple of recent academic articles that deal with plastics - one on plastiglomerates (Corcoran et al 2014) and one on common meal worms that can biodegrade Styrofoam (Yang et al 2015). Based on the ethnographic material and interventions Lindström and Ståhl have written an imagined dialogue between a ragpicker who collects plastiglomerates and a composter who tries out domestic plastic composting. The speculative fiction is called Plastic Imaginaries - the ragpicker meets the composter and can be read in its entirety in the HYBRID MATTERs exhibition. Below you’ll find an excerpt, but stay tuned - it might turn up in another format on this web page. For how long are you gonna do this ragpicking? As long as there is plastics washing ashore on the beaches. As long as we need plastics. As long as I have access to the beaches. I also want life to continue, but I’m just starting to wonder if we can actually go on living like we used to. I want something more transformative. What do you mean? Do you mean your experiments with composting plastics? Well, that’s just an experiment. I don’t know where it’s going. But yes, the practice of composting has moved my thoughts. The ragpicking and turning plastic debris into a new resource for new plastics is perhaps too much of a circular practice. I think we need to break this circle. But I’m also worried that the biodegradation of Styrofoam is contributing to that kind of unsustainable sustainable living. There’s so much hope invested in both of these practices.